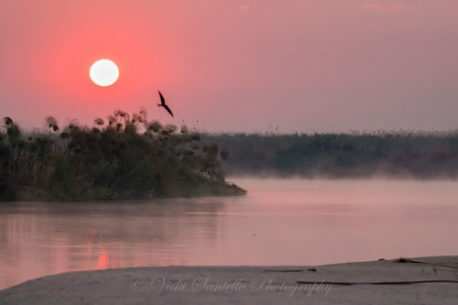 A glorious morning came upon the Chobe River after an unexpected cold summer night. The contrast between the warmer temperature of the water and the cooler temperature of the air caused mist to rise from the river. The magic took flight when dawn broke into a soft pink light and skimmers flew through the mist and the papyrus reeds.